All OPC Awards Dinners are special to the Club. 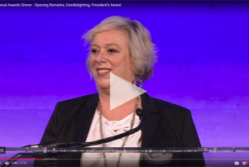 Still, in the past few years, hearts and minds have been focused on making the OPC’s 75th Anniversary Awards Dinner on Thursday, April 24 at the Mandarin Oriental Hotel an extra special occasion. Early in the day, OPC representatives will participate in a special ceremony to flick the switch that lights up the Empire State Building. 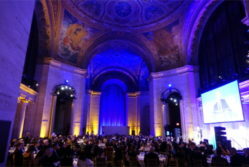 Throughout the dinner, the New York landmark will be bathed in blue — the official color of the OPC — in honor of the Club’s anniversary and gala. The keynote speaker is former foreign correspondent and current U.S. Permanent Representative to the United Nations Samantha Power. She began her journalism career covering the Yugoslav Wars from 1993 to 1996. In 2003, her second book, A Problem from Hell: America and the Age of Genocide won the Pulitzer Prize. In 2004, Time magazine named her one of the 100 most influential people in the world and in 2007 she wrote a regular column for Time. She became a scholar of U.S. foreign policy and an advisor to then-Senator Barack Obama and subsequently President Obama. OPC President Michael Serrill has selected veteran foreign correspondent Bob Simon as this year’s recipient of the OPC President’s Award. Simon began his reporting career 42 years ago in Vietnam for CBS News. He has also reported from the CBS London and Tel Aviv bureaus and in 1987 was named the CBS News Chief Middle East Correspondent. He has won several OPC awards, most notably for coverage of Vietnam, Egypt and the Rabin assassination in Israel. He is currently a full-time correspondent for “CBS-60 Minutes,” a show he has contributed to for 18 years. The Awards Presenter is David Muir, Weekend Anchor of ABC News. Muir is also co-anchor of 20/20, ABC news magazine. Muir joined ABC News in 2003 and in 2012 was the first American journalist to report from Mogadishu on the Somali famine. He also reported on the Israeli war with Hezbollah and was in Gaza in 2007 to cover the Hamas coup. The nuclear accident at Chernobyl in the Ukraine, the earthquake in Haiti and the uprisings in Tahir Square were covered by Muir for ABC World News. OPC Foundation President William J. Holstein is the Awards Dinner Chairman who is responsible for corporate dinner support of the event. Robert Friedman of Bloomberg News served as head judge for the 22 award categories. A special edition of Dateline magazine is being produced under the editorship of OPC Board members Charles Wallace and photo editor Robert Nickelsberg, designer Nancy Novick and OPC intern Mariam Haris. The magazine will feature writers and photographers who covered some of the biggest events through decades of OPC history. The OPC’s first dinner was held in February 1940 and celebrated the publication of The Inside Story, a book of behind-the-scenes stories by foreign correspondents, edited by Robert Spiers Benjamin. Guests included dignitaries such as former President Herbert Hoover, Alexander Kerensky, a major political leader of the Trudoviks, a moderate socialist party that was swept away during the Russian Revolution, OPC founding members Irene Corbally Kuhn and Robert Benjamin and OPC’s first President Wythe Williams, London correspondent for The New York Times who covered WWI. That first awards dinner had an ambitious international menu and the Mandarin Oriental will do a modern adapation of the original menu for the Jubilee Dinner. Pricing for this year’s dinner is $250 for OPC members and one guest; $750 for non-members. Table prices are $7,500 (Friend), $9,000 (Sponsor), $12,000 (Patron), $15,000 (Fellow). With the Lenovo-sponsored pre-party and Daimler-sponsored after-party, the event promises to be a jubuliant celebration of the OPC. The 75th Anniversary OPC Awards Dinner takes place on Thursday, April 24 at the Mandarin Oriental Hotel, 80 Columbus Circle at 60th Street. Reception begins at 6 p.m., Dinner starts at 7 p.m., and the Meet the Winners After Party ends the evening.